Aquatic fitness, pilates and Tai Chi are training and also therapeutic methods to strengthen the spine, the muscles that surround it, through exercises that aim the improving of posture, muscle tone, flexibility, etc. In water the force of gravity is lower, so the back does not have to support the full weight of the body and decreases the impact in this area during exercise. The water exerts a work of cushioning and buoyancy and at the same time water opposes a soft resistance. That is why swimming routines, also known as aquagym, are ideal for treating spinal problems, because those allow strength work that strengthens this structure (spine and muscles), but without any damage. READ: Subacromial Impingement Syndrome: All you have to Know to avoid shoulders Pain. In addition, the massage effect exerted by water over the muscles significantly diminishes the pain. Thus, walking through the water with long strides, moving your arms and keeping your back straight or swimming in any style can generate a great benefits for spine and muscles around it. Similarly, stationary exercises, balance on one leg or do the pose of Superman leaning against the wall, among many others, have shown good results. Infiltrations, manual mobilizations, cold and/or heat compresses and treatment with high technology equipment are just some of the options that science has used to treat spinal problems. However, often these methods, when not applied properly, end up "triggering" other pathologies or sometimes do not show the expected results. READ: All the diseases you can prevent by Working out daily. 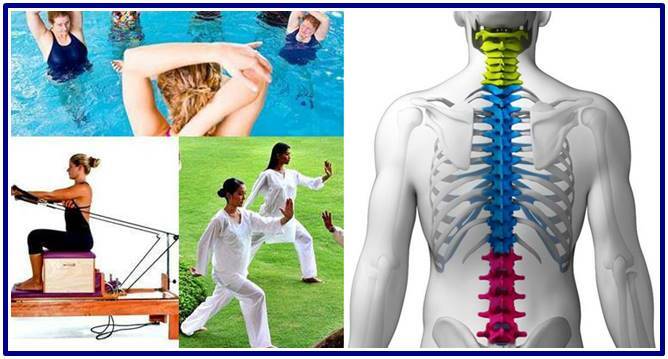 But the thing many people do not know is that today the exercise is once again at the service of health, because disciplines such as tai chi, plates and aquagym or aquatic fitness are also being used in favor of these patients, victims of "killers" such as low back pain, cervicalgias, dorsalgias, scoliosis, herniated discs and radiculopathies. Most of them are caused by inadequate movements or poor posture during daily activities, sitting for long periods of time, which weakens the muscles of the back, as well as the lack of alignment and balance associated with age, leading to loss of flexibility (one of the health-related fitness components). The idea of ​​these therapies (Tai chi, pilates, aquatic fitness), unlike conventional therapies, is to give the person an integral management from the feet to the head, so that way the body recognizes its natural posture and returns to it. In fact, from this point of view only treating the part where the symptoms manifest is a mistake, because the part of the body that suffers the pain is not always the one that is affected. The best thing is that with this forms of treatments the results begin to be seen very soon, on average, within two weeks, and pain, one of the symptoms that most affect the quality of life of these patients, is eliminated Up to 90%. Do not resign yourself to continue living with annoying symptoms and to sacrifice the quality of your life. Take advantage of these proven therapies and heal your spine at the same time as you exercise to work on muscles and of course you overall wellness. READ: Learn Everything about Prostate Cancer. Based on yoga, which means union with God, and was born with the idea of training the body to endure long quiet and concentrated during the meditation sessions and for the person to have many years of life. Subsequently, pilates, the training where you perform strength exercises with equipment (reformers), takes up the principles of yoga as breathing, contraction of muscles and proper use of the body, becoming another alternative for patients with spinal problems . Pilates not only strengthens the muscles, but works the postural awareness, the abdomen (body core) directly related to the health of the back and hip, which is often also affected by spinal problems, providing great benefits. It proposes exercises of spinal alignment, stretches and postures like the one of the boy or the one of the cow, that keep the body relaxed and flexible. READ: Basil Properties to Improve your Health. It combines breathing with martial arts and meditation, using slow and controlled movements that allow energy to flow. The first (breathing) promotes inhaling deeply and relaxed until the abdomen swells, causing the muscles of the back to tighten and the oxygen reaches the entire body. This happens because the abdomen and back form a muscular ring in which any movement that takes place in one of these parts has an effect on the other. For their part, martial arts include consecutive movements that mobilize body tissues and strengthen muscles and tendons. They are more than 300 exercises of fight and combat, derived from animals like the monkey, the dragon, the crane and the snake. But tai chi, in particular, focuses not on the strength of the muscle but on the soft force, that is, that of the tendons, as well as in subtle movements, in which the opponent's force is used to overcome it. And mind-strengthening meditation helps the patient deal more easily with pain. - Increased blood pressure due to the force and tension that are generated. - Increased risk of injury, due to twisting or poorly made forces. - Severe pain, which prevents normal activities and occurs daily. - Sensation of "electric pain".